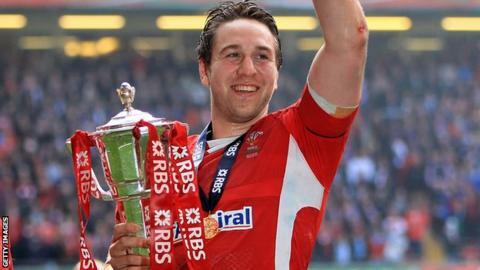 Former Wales captain Ryan Jones has retired from playing on medical advice. The 34-year-old, who won 75 caps for Wales and won three Grand Slam titles, had been recovering from shoulder surgery at the end of last season. But Jones has been forced to abandon plans for a comeback with Bristol this season after being told he risked further significant damage. "The old cliche of making the decision with a heavy heart is true on this occasion," he said. "The last few weeks have been emotionally tough for me. I've had to recognise, and come to terms with, the fact that while the mind is still very willing, the body is no longer able to do what I want it to on a rugby pitch." The versatile back-row forward had a year left on his contract with Bristol, having joined the ambitious club in 2014 after 10 years with Ospreys. Shoulder injuries had blighted the latter stages of Jones' career, and another hefty blow in the first leg of Bristol's Championship play-off final against Worcester in May led to the latest surgery. The former Ospreys captain is one of the three Wales players to have won three Grand Slams in 2005,2008 and 2012. He played in Wales' 2011 World Cup semi-final loss to France, and also featured in three games during the 2013 Six Nations as Wales won the Championship title, missing the decider against England with a shoulder injury. His last cap came in 2013 when he led Wales to a 17-7 win over Tonga in November. In all, he captained Wales on 33 occasions - a record overtaken by current skipper Sam Warburton in the 2015 Six Nations match against Ireland. Jones also played in three Tests for the British and Irish Lions on the 2005 tour to New Zealand, won 3-0 by the All Blacks. "Looking back on my career, I can say that I have enjoyed some fantastic highs and, although there were some well documented lows along the way, the overriding feeling is one of immense pride and satisfaction," he said. "If someone had told me 20 years ago that I was going to achieve and experience a fraction of what I have then I would have been over the moon. "Highlights of my career obviously include three Grand Slams with Wales and four league titles with the Ospreys, but I can't take a final bow without referencing the stand-off against the Haka in 2008. "It was absolute theatre and although I never got to beat the All Blacks, I think we can claim that victory at least."